I’m not keeping a plant-forward life but I do love vegetables a lot. 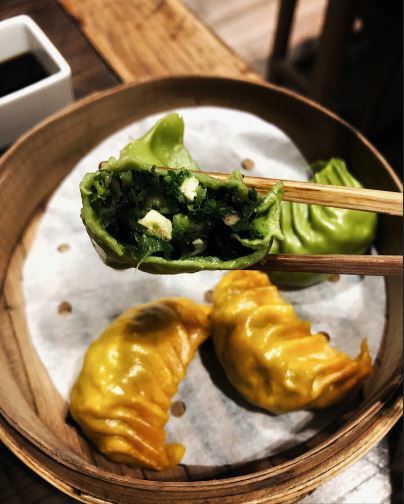 Some vegetarian spots in Shanghai are actually very delicious that I go back for more, but probably not this one. Wu Guang Tang located near Jiao Tong University. The restaurant is covered with green wall and a terrace on top of the building. The interior as well give you a very ZEN feeling, featuring Chinese style decorations, which is very nice. They offer all-you-can-eat dining and normal menu. Staff there were nice enough to let us take a look at the buffet section, and we went for menu as there’re more choices. We ordered 5 dishes- baked potato, steamed dumpling, tofu roll, corn and sweet potato pancake, and a classic stir fried broccoli. Starting from the good ones, I like the baked potato a lot and it’s also on the “hot list”. It’s full of flavor and I like the fact they do it in thick slices, so it’s firm and creamy. Steam dumpling is quite nice as well. The skin is thick with a good amount of veggie filled inside. Bright cute yellow and green are also a plus. Other three of the dishes I’m not impressed with. It’s all on the oily side, especially the broccoli, which is not what I would expect at a vegetarian restaurant at all. 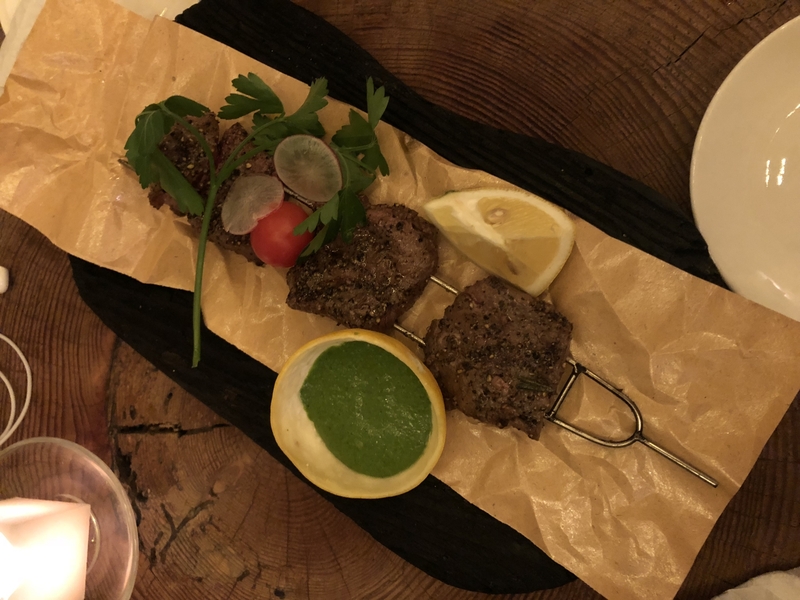 Overall the food are good but nothing really special and creative to write about. There're just more other exciting spots to dine in Shanghai. The price and portion on the other hand are good and will keep you full. The venue is clean and comfortable with private section to dine in, and the staff are truly friendly and helpful. But I would probably not going back any time soon. 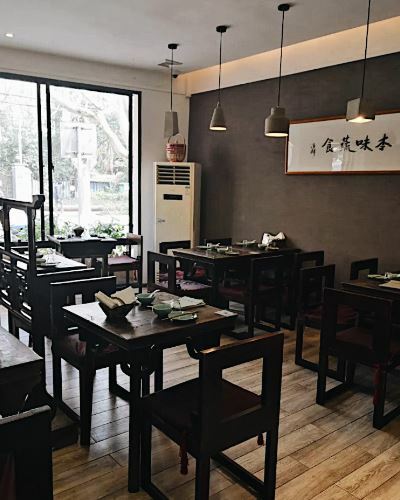 *Wu Guang Tang has a beautiful dining environment and solid Chinese dishes. They provide all-you-can-eat and menu options. This is an affordable vegetarian spot in the quiet neiborhood. Is It Really Sugar, Spice, And Every Thing Nice? 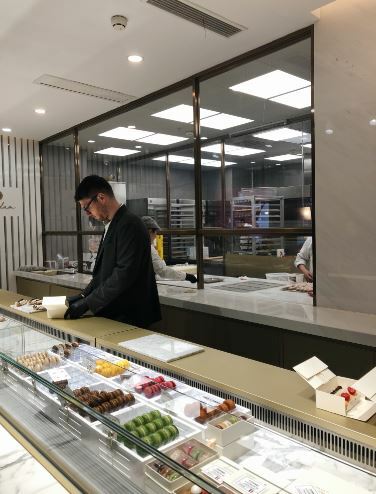 The famous French pastry shop had opened in Shanghai, and clearly everyone is excited. Went there on a freezing Sunday, and it seemed like all the foodies in Shanghai gathered in one spot. The line was too long so I decided to take out. When it’s my turn to pick out the flavors, pretty much everything ran out (of course), and there’re only three choices left. I took all three flavors and here’s how I feel. The éclair, like they said, are all beautiful and look amazing. I understand the camera-eat first- rule under this circumstance. 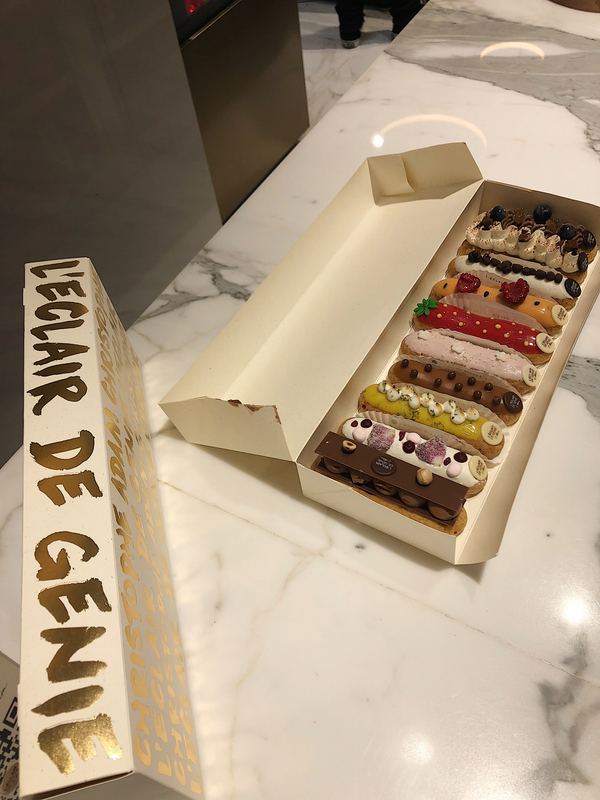 Priced at 48 RMB, the éclair comprised of perfect sized dough filled with cream, covered with shiny icing, and delicate decoration on top according to each flavor. Almost too cute to eat. While it is sugar, spice, and ever thing nice, I found that they are overall prettier than they taste. I had vanilla topped with chocolate, Jasmin (Shanghai edition), and passion fruit. I liked that the passion fruit flavor had a well-balanced sweetness and sourness, and the raspberry on top added a bit of freshness. I also liked the high quality chocolate on top of the vanilla/chocolate flavor éclair, and the creaminess of the custard inside. Not a big fan of the Shanghai edition flavor, it tasted sweet and salty, which I found weird. 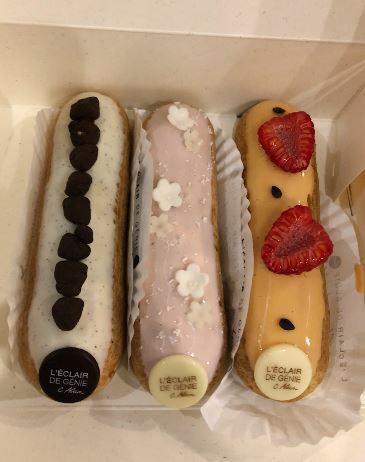 I found they all had a strong fragrant that I don’t like, and the éclair was tiny which made me wonder if I’m just paying for the Instagram photo. So yes, it’s a work of art with luxury branding, but I probably won’t re-visit. Still, if you’re a fan of dessert and want to keep up with the trend, they have lots of options other than éclair. Some looks very over the top but people seem to enjoy it. 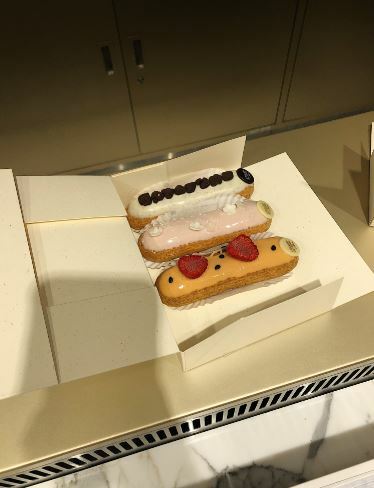 * 144 RMB for 3 éclair. 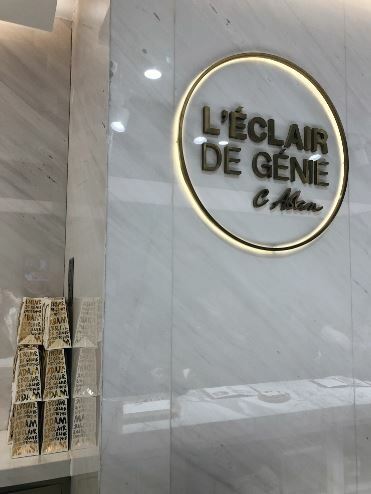 * L’Éclair de Génie by Christophe Adam’s just opened and is the wanghong place to be. They offer beautiful desserts and luxurious ambience to dine in. Éclair is nice but pricy to compare with. Great place to have cute pictures and afternoon tea with group of girlfriends. After several visits I can say Barbarian is one of my favorite bars around Jingan. Good drinks, great food, and lovely atmosphere. Let's start with the cocktails here. It's versatile and fun to drink here as they make cocktails according to your flavor of choice. Simply choose a base, your preferable taste and flavor to get your customized cocktail (Around 60 RMB), and base on experiences it’s always with delicate decorations like dry fruit and sweets that make it pretty and tasty. 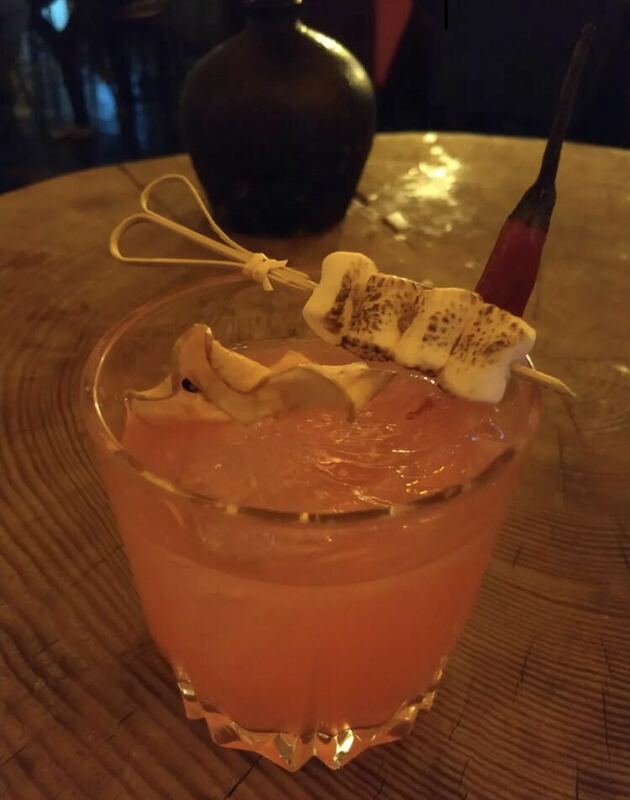 They also have some innovative drinks like frozen popcorn, looking crazy and totally out of my imagination. They have good food and it’s very good for a bar. My favorites are baby potato (32 RMB), eggplants with cheese (28RMB), and all the meat skewers (30-70 RMB accordingly) are spot on. They season them very well and it’s juicy with rich flavors, and the sauce on the side is my favorite. 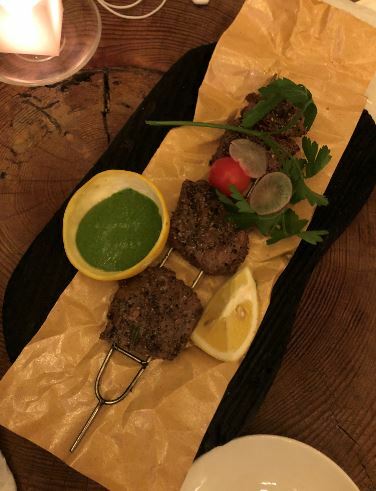 Portion is good and perfect for sharing, and is served with wooden platers that looks pretty and unique. I love the chicken skewers and they also have sets for easy options. I never tried dessert there but it looks very tasty. 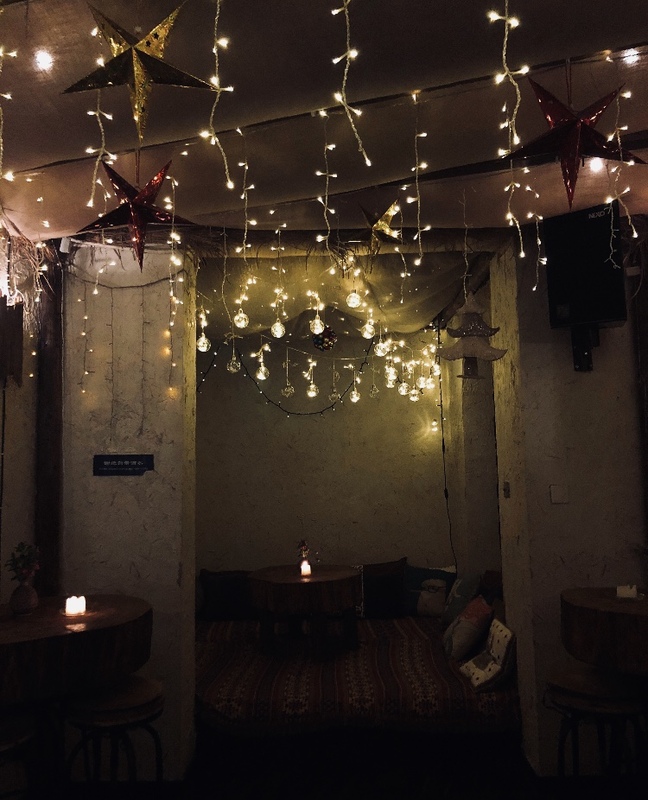 The bar has a chill vibe but also great for a date. The little Christmas lights get me every time. Upstairs terrace is great to enjoy during warmer months and is always crowded too. The place is always busy book ahead if you can, but the service is quite fast and the staffs are always helpful. You definitely see me there again! *Barbarian has great food, nice drink, and warm atmosphere. 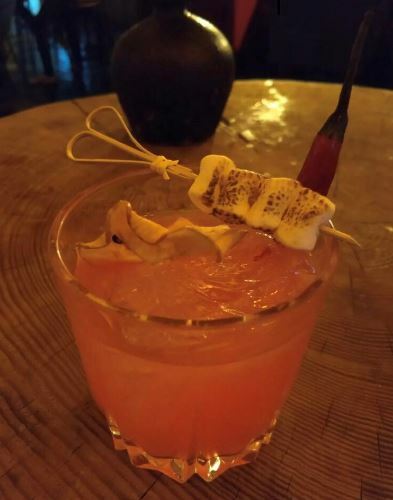 Always fun to get a customized cocktail that fits your flavor of choices, and the delicious barbecue food is just impressive for a bar! Sunflour just renovated last year and I’m pretty impressed. As soon as you walk in you will see rows of bread and pastry, and you’ll definitely smell them too. You can also see the making through the glass covered kitchen and everything looks freshly baked. Decorate with wood and gold details, plus a bit of greenery on the wall, the ambience is very comfortable and warm. It can get a bit noisy with the crowd, but there’re still lots of people working and sipping coffee here since they have plugs beside most of the table. My family came to visit and at the last day of their trip I took them there for brunch. There’re around 20 different choices on the brunch menu, and we got the set of Scramble Egg with Smoked Salmon And Avocado Salsa Tartin. It’s good but just good, and the fries on the side is weird for me. 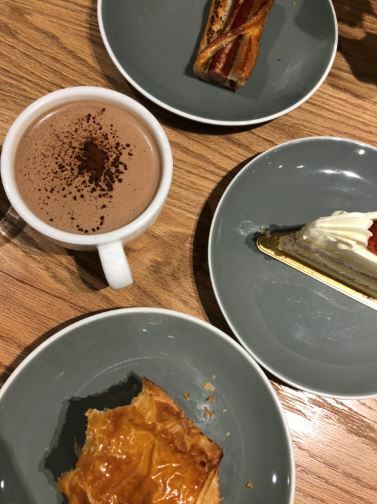 We also took the bakery goodies, a cup of latte and hot coco. The bread and dessert were both delicious, soft and crunchy when it should be. The drinks are also good and I love the hot coco. It was the right sweetness and bitterness, serving perfectly with the strawberry cake. Overall it’s a joyful visit and food is decent, but I do recommend baked goods over brunch set though. *Sunflour serves freshly baked goodies and great drinks. A great café that offers a warm and comfortable place to work and dine in. Set menu are generally good and with reasonable price. SongFa is a pretty famous restaurant from Singapore. It’s famous for its Singaporean style bak kut teh, which means prok rib soup. I like bak kut teh in Cantonese style with medical herbs and strong flavored broth, but SonFa is very different from what I’m used to. Their soup is clear and very peppery, they also put a lot of garlic in the broth and makes it spicy and warm. You can tell it’s cooked for a long time and taste all the ingredient in every bite. They offers different type of meat to pair with the soup, including pork rib, prime pork rib, white fish, pig’s stomach, liver, and tail. I went with my colleagues after CNY holiday and they ordered almost everything. While some were too daring for me, I did try most of them and all were very tasty and tender. We also got youtiao(Chinese fried churros) and meesua (noodle) to eat with and both taste incredible. 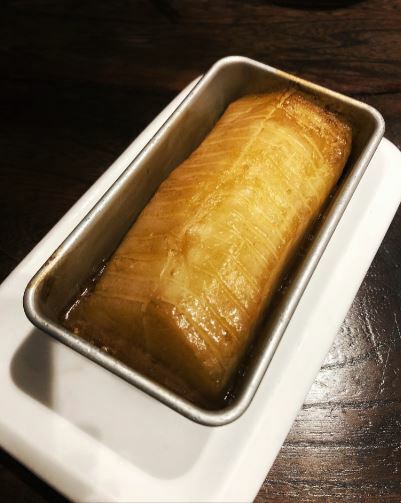 I love how juicy the youtiao gets after soaking in the broth. I believe the soup was served for one person, but they provide free refilled for the broth, which makes it easy to share with people. 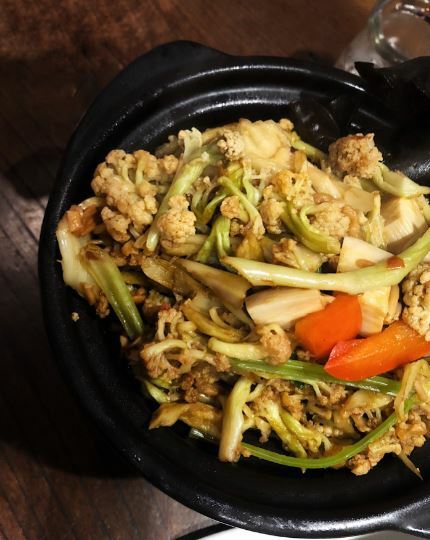 We also ordered some side dishes, including vegetables and braised platter (egg, toufu and more pork).The vegetables taste fresh and crunchy, and the braised platter is savory and definitely a good complement to eat with the soup. The soup cost around 56 RMB and side dishes are in between 10 to 30 RMB. The restaurant is in Kerry center and it’s very clean and modern. Great for the winter days like this in Shanghai! One the side note, the venue in Kerry Center is quite small and crowded with limited seats. I would recommend it for a casual date or eat-alone-place. *You'll get bowl of high quality soup with intense pepper/garlic falvor to warm up your body. The restaurant is quite crowded but has great services and friendly staffs. Definitly THE place to get authentic bak kut teh. Coco curry is my go to Japanese place when I’m craving for Japanese curry and tonkatsu, aka Japanese pork chop. They have tons of choice with very affordable price and fast service. From pork, beef vegetable, omelet and more, and if you can’t choose one, you can actually get it in one plate with their customizable menu. They also have options for the amount of rice and spice level, which I find really useful since I can never finish my rice. 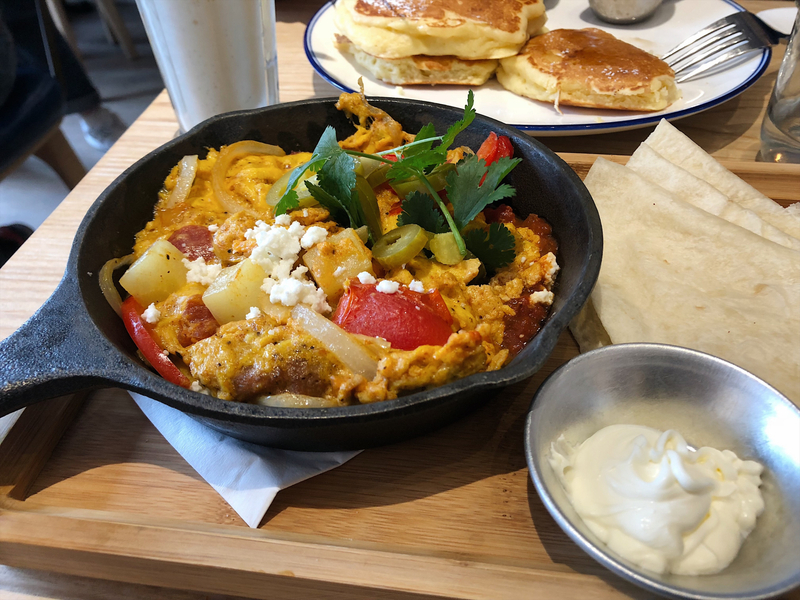 I like their omelet very much, it’s juicy, tender and very well cooked. I am not a fan for cheese with curry since it’s already so heavy and sweet itself, but I’ll definitely recommend if you are a cheese person, and definitely add the vegetables! Another thing about the food, I suggest you only get the curry but not others like pasta. Food other than curry there taste below average and you can probably (definitely) find better place. I like going to the one in Jiu guang plaza in Jingan, it is clean and warming, perfect for a quick lunch or dinner. The price is around 40 to 50RMB and will definitely keep you full for a while. The Japanese fast food chain gives you proper and quick comfort food. It’s not fancy but definitely tasty! I came to Gemma on a Monday night with my colleague. We started with the happy hour glass of wine until 8 PM (Yes, we were pretty stress out). For appetizer, we got a fish tartare (RMB 120), and except it looked very pretty and well decorated, it didn’t really make an impression regarding of the taste. As for the main course, the pizza (RMB 110-120) were just simply delicious! It was full of cheese and flavorful with just enough of burned. The Italian thin crust was crunchy yet chewy, and very well-cooked. Plus the service is great, and the staffs are always attentive and friendly. Water on the table was always topped up. I love it so much and went back later on to try more of their pizzas, and Gemma probably serves my favorite pizzas in town now! The prize isn’t that cheap but they do have daily discounts on certain food, as well as lunch set (RMB 108) I believe. The atmosphere is also worth mentioning. 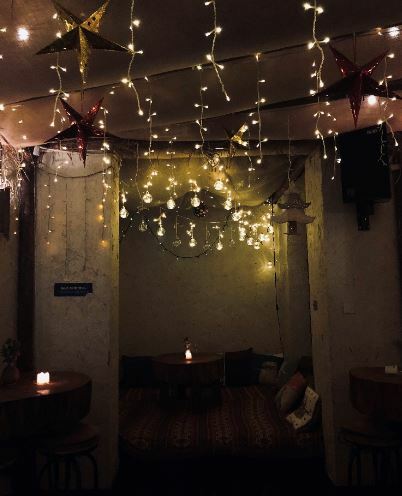 It’s pretty romantic with well interior design, yet casual with the open space and chilling music playing, which is perfect for a date like this! Cheese, So Much Cheese! The moment you walk in La Cabane you’ll feel that smell. It was the first time I had Raclette and it was so much fun! 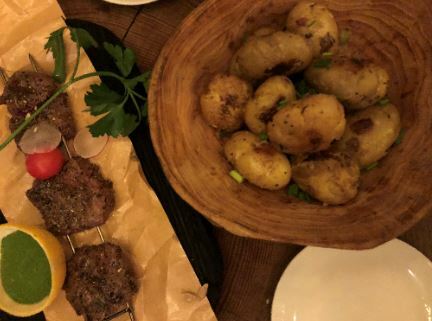 The set was 198 RMB with slices of Raclette cheese, potato, cold cuts, pickles and a bit of salad. You can also get the extra cheese with 40 RMB more. I couldn’t stop using the grill device with small pans to melt the cheese, and watched it slide onto the steam potato. It was very satisfying even just by watching it. And this is how to have fun while eating. 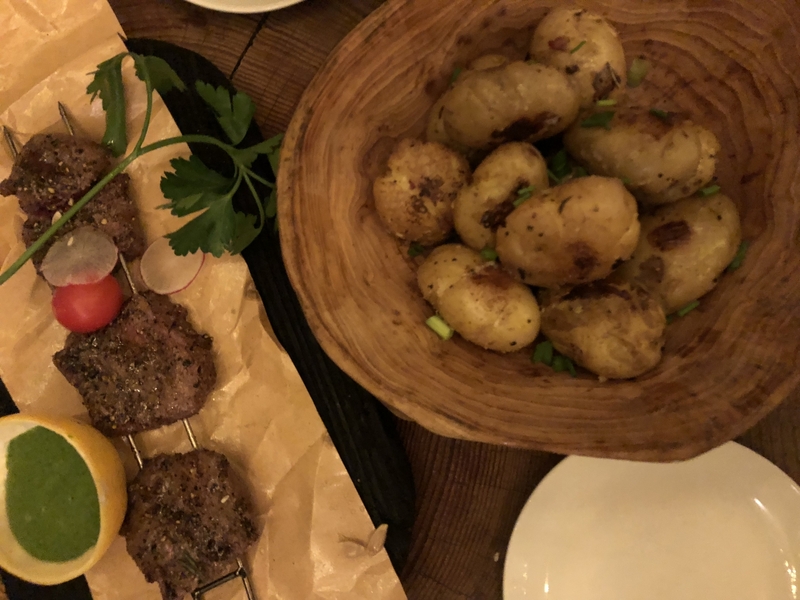 Besides Raclette, we also got potatoes savoyarde. I love this classic potato dish. Crunchy and flavorful with mouthful of chunks of potato, it was very delicious. I had a lemonade to balance all the cheese out and stay fresh, but it was a bit too sweet for my taste. La cabane means shelter and this place is warm, cute, and very cozy! Perfect for winter like this. I went there for lunch and took hours with all the melting and talking. It’s quite a sociable and relaxing dining to do with friends, family, or date. The staff was friendly and helpful and the food was delicious. It’s hard to go wrong with plenty of cheese anyways! Traditional Chinese yum cha, which means tea-drinking, also known as dim sum, are my favorite kind of Chinese food. The small plates of delicious dian xin get me excited just by talking about it. We went for lunch because I was craving them badly, and Royal China was close enough. We lined up for a bit since there was quite a crowd, which looks promising in a way. The food was pretty decent for its price. We got couple of dishes like shrimp dumplings, shaomai, deep-fired shrimp and tofu rolled, steamed tofu rolled and cream custard buns. I like the shrimp dumpling the most and remember to ask for mustard or chili. The cream custard buns was a mistake since I meant to order egg custard buns, but was delicious too. The service was just fine since we had to keep asking to get what we asked for, and the ambience wasn’t really nice with all the crowd talking loudly. I have to get my tea when having dim sum but the price for tea was too pricey, and it just taste like normal tea. Don’t mind going back for some quick grab but I would not recommend it with friends. Dining in Black Pepper isn't just about the food, but the ambience itself has them winning. It's chic, spacious and with perfect lighting. The music is perfect and the intimate environment with delicious meal make it the perfect date night spot if you're feeling a bit fancy. 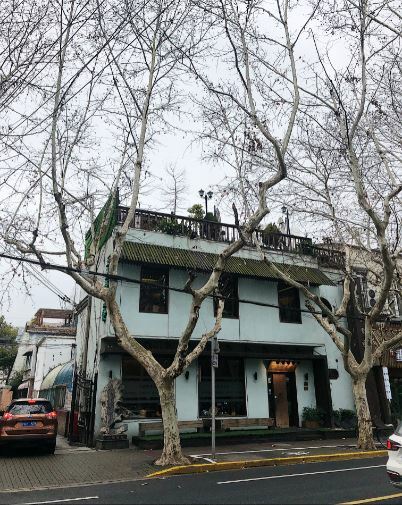 It’s located in a very nice area close to West Nanjing road walking street, crossing through the old Shanghai houses to reach the place. You can definitely feel the vibe when walking through the old lanes. We had the stuffed smoked salmon for starters, following with lamp chops, zucchini pancakes, and of course, 2 cups of wine. The smoked salmon was fresh with a bit of crunch with the leaves in it. I especially love the warm and flavorful zucchini pancakes with sour cream on top. Never a big fan of lamp but it was cooked very well and taste tender and fantastic. All the dishes are with good portions and can definitely keep you full. The service was also on point with welcoming staffs and friendly manager suggesting dishes for us. They can speak English and the menu is also clear in English. It was a lovely night and surpass my expectation. Great surroundings, ambience, and food. 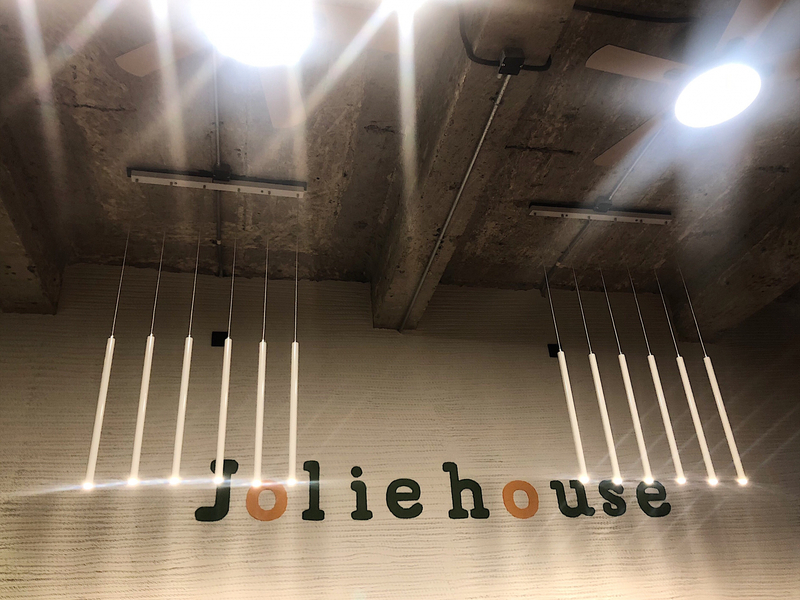 Do your date and yourself a favor and try this place now! It was a lazy Sunday when I tried my best to fill up my belly within walking distance from my apartment, and Bites & Brews is perfect for that. The restaurant offers food that are simple but solid, affordable yet very delicious! Cheddar and mozzarella melting on top of the smoked ham with crispy and dense sourdough bread, it’s straight-up classic panini with total delight. Best of all, you can be very satisfied with just 28 RMB. Filled with melty cheese, chicken and avocado pressed with pesto sauce, the flavor is smoky and layered. The bread is crispy with all ingredients blend perfectly together. It’s a simple dish that will make your heart swoon. Get the fries! Crispy, salty, dense and fresh, it’s what you ask for in a good French fires. And like all food here, it comes with big portion, so be ready to share… or not. This is how cozy I got. It’s sweet and warming, and I’m glad I stick with hot coco when everyone else was drinking beer. The ambience is cozy with food serving up with wooden tray, and open space with out-door seats to enjoy. 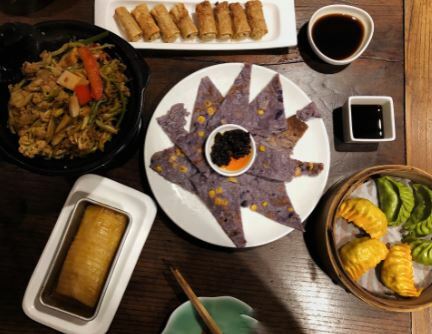 Keeping it casual can be hard in Jing’an with so many fancy restaurants around, but Bites & Brews certainly makes easy bites perfect for anytime. Cannot wait to go back again! Shiny crust with a little bit of hardness, this is how a good bagel should be. Boom boom bagels isn’t new but surly still a hit place, judging by the crowd, which is a mix of 30% of Chinese customers and 70% of foreigners (That’s my definition of a Wang Hong place). The restaurant offers an interesting menu, focusing on bagels with interesting flavor of coffee and cocktails. The space is quite small and is decorate with wood, neon sign, and a bit of industrial elements. They also have a row of seats facing the road with wide open windows, as well as a row facing in, which are of course always taken. We ordered a Bacon Egg & Cheese Bagelwich (RMB 45) and a Homemade Sausage Pattie Egg & Cheese (RMB 45). I do appreciate the fact that you get to choose the bagel you like, and you can also build your own bagel. The portions were huge and both bagels tasted very chewy, thick, and had just the right amount of crunch when taking a bite. The sausage pattie was on the salty side but was very juicy, and was perfect with melty cheese. 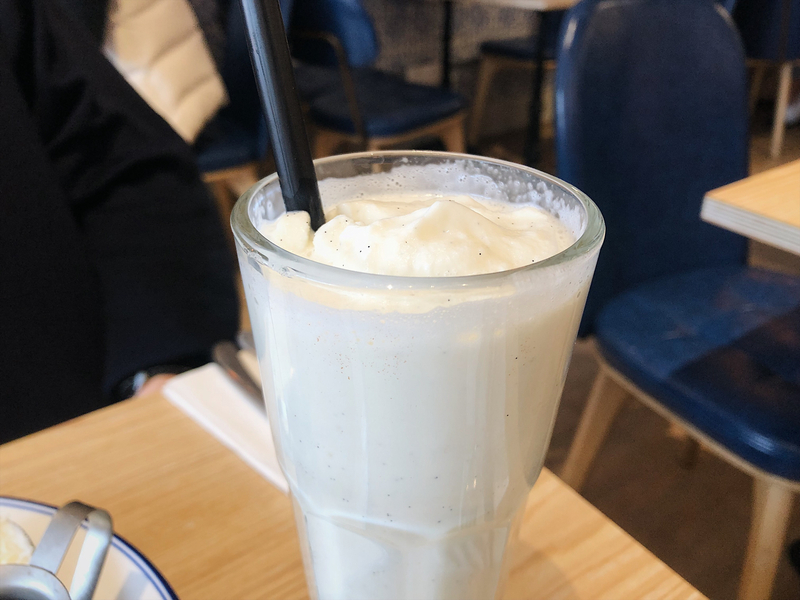 They have some interesting drinks menu like coffee cream soda and jasmine matcha, but we didn’t get to try it this time. 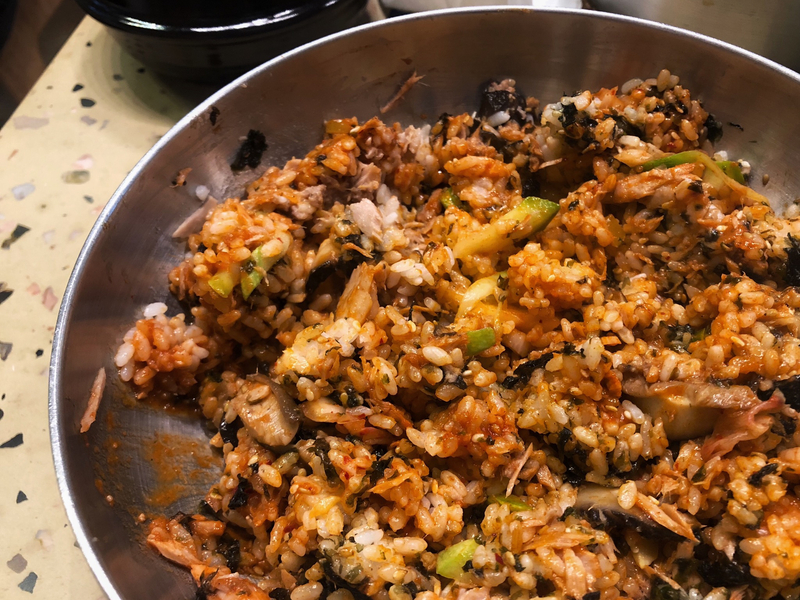 Overall it feels very tasty and filling, but also a bit heavy since everything is quite oily. The shop remain its hype for a reason so if you haven’t been by, it's worth the visit. A reason why I can’t become vegetarian- burgers. They are affordable, fulfilling, and perfect for anytime. Brunch, lunch, dinner, and late-night-supper. You name it, I’ll eat it. 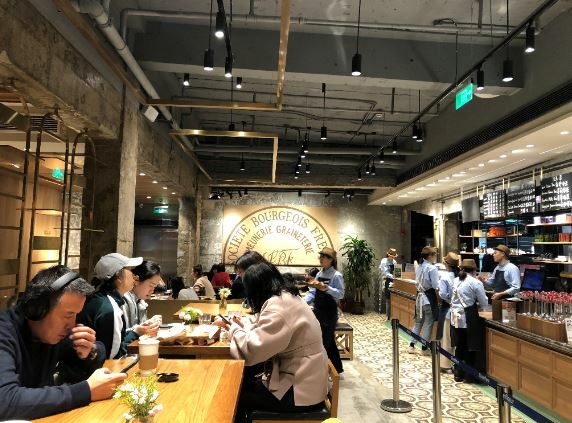 Shanghai has several good spots that’s famous for their grilling and bun-ing game, and Habit is a new place I found in Jing’an which I just added in my “good burger list” (yes I update the list on my phone for burger). Habit just opened here in Jing’an and it’s originated from the States. I passed by when the place is still renovating and decided to stop by again later. I surly made the right decision. The place is very clean and seats are comfortable, and like every fast food chain you can see through the kitchen. I went for an Original Double Char set, which included fries and a regular drink (all you can drink). Seriously, I’m in love! The burger is juicy with two-patty stack slathered in melty cheese, and tucked with lettuce, pickles, and caramelized onions between a toasted bun. The crispy golden fries are thick and flavorful. Oh! Did I mention they have an open station where you can help yourself with all the sauces, jalapenos, chilly and lemon slices? They have plenty of choices including burger, sandwich, beer, milkshake and salad. And from what I’ve seen from other table the salad looks very decent as well. (Obviously I’ll take it as side with my beloved burger.) I looked it up on delivery apps and it’s not on it, so move now and get the burger yourself. Recommended by a friend, and I thank her until now, Bread etc. is a great place to dine for brunch, afternoon tea, or even dinner. There’re so many choice on the menu and all the dishes are very versatile. You’ll never run out of idea here. 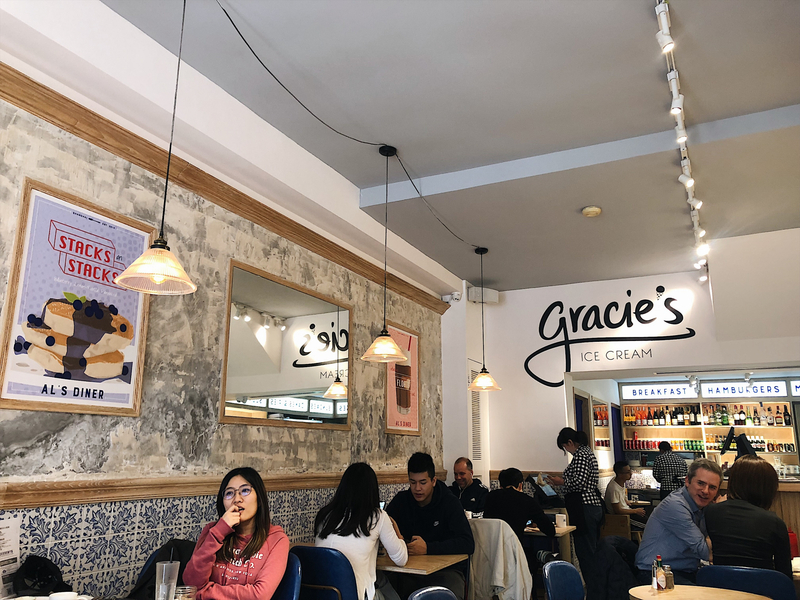 The restaurant itself is spacious with two floors and outdoor seats, and even with indoor seats you can enjoy the sunshine thanks to the big windows around. It’s spacious but like all restaurants in Shanghai, it’s always packed with people. The staff are always helpful and friendly, and the dishes are all well- presented and tasty. It’s not my first time at Bread etc. and definitely won’t be the last! So far I have tried French Pastry Basket, Beef warm sandwich, and Avocado cold sandwich. Almost everything in the French Pastry Basket taste good, except that one time the croissant was a bit dry and did not taste like it was freshly made. The set comes with two drinks and can definitely filled you up. The carrot juice is freshly made with no added sugar, and the coffee taste pretty well made as well. I love both of the sandwich here and am very satisfy with the baguette, and if you like poached egg, ask for it! All the dishes taste very healthy and delicious, and be aware that they all serve with a good portion. At the entrance you’ll see the beautiful pastries and desserts, and be sure to grab one. I’ve tried lots of them and personally love the coffee éclair and berry tart. Everything is exquisite and taste just as good! It’s always a pleasure to go to Brea etc., especially at the sunny weekend where I can sit outside and enjoy the sun, good food, and good talk with friends. Entering the small ally around IAPM mall and through the old Shanghai houses, you'll find the three floors Cantonese restaurant packed with people waiting to get a table. 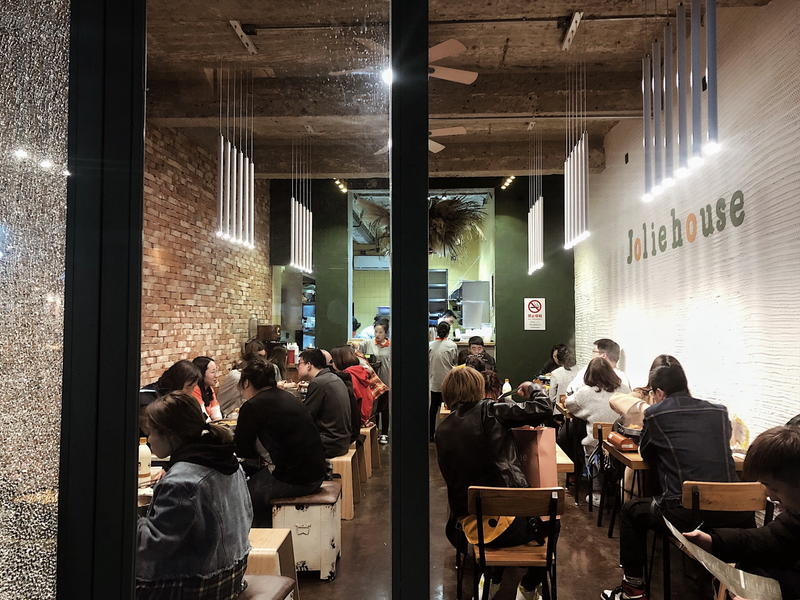 The restaurant is fairly popular, so you’ll want to book ahead before coming. I came with 8 other colleagues and got a private room, which can fit in more than 10 people. Note that it was a hassle to get a table and the staff were everywhere, but it will be a good place to bring in a big group of friends since the portion is pretty fulfilling. Starting with the signature dish from the restaurant, the ginger chicken is definitely filled with flavor but like most dishes here, it’s on the oily side. Vegetable like pan-fried green beans and Kai-lan taste good, but like every other Cantonese restaurant can offer. The beef with soy sauce is also better elsewhere if comparing to what I had before. Someone ordered a sweet dish that’s fried taro covered with sugar. It’s something new to me and taste good when serving hot; crispy on the outside and soft in the middle. I’ll never leave a Cantonese restaurant without a bao zai fan so I got the classic one with lap chang, but yet again not too impressed with the dish. The only thing is that it’s probably one of the biggest portion of bao zai fan I ever got here. We paid around 70 RMB each, which is very cheap for what it offers. I can see why the restaurant comes with a lot of fame, the old Shanghai alley is very unique and easy to impress, food is above average and the serving is enough to fulfill a table of people. While I don’t really feel the ambiance since it’s a bit messy, I’ll prefer to go somewhere less crowded and comfortable to be in. Like every Taiwanese folks, I'm a big fan of Ding Tai Fung, and it's kind of an instinct to go there whenever I'm craving for soup dumplings. 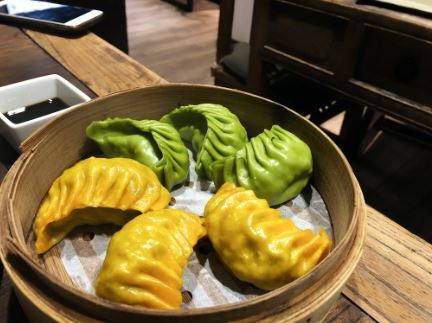 Today my colleague asked me for lunch and we decided to step out of comfort zone to try out the famous rainbow soup dumplings. We ordered two baskets of the Rainbow Soup Dumpling and some vegetables. I have to say this must be the prettiest soup dumpling I’ve ever seen. Each colored represents different flavors, and let me break it down to you! The original (white)- Surprisingly surpass my expectation! The skin is thicker comparing to Ding Tai Fung, while it doesn’t really effect the flavor. The broth exploded and taste a bit sweet but not too oily. Luffa gourd (green)- Fresh and easy. I love luffa gourd in soup dumplings since it’s naturally sweet. If I could I would probably order a bucket of it. Foie grass (yellow)- It’s creamy and very unique, even though it’s not a good mix in my opinion. Black Truffle (Black)- Personally not a big fan of black truffle, but it truly is flavorful, adding a touch of luxury to the soup dumpling. Crab roe (orange)- It’s a pretty common flavor for soup dumpling, and definitely my personal favorite! Garlic (grey) –I love the color and the flavor is very on point. Not sure if it’s the garlic but the broth taste more fragrant than other flavors. It’s fun and exciting to try every flavor while looking at the card on the table, imagining the taste of each ones. The restaurant itself is also clean and very easy to dine in. While I still favor Ding Tai Fung over Paradise Dynasty, the look of it is a good enough reason to pay a visit! Healthy , Fresh, And Tasty! When I first moved to Shanghai, I was actually surprised by the amount of healthy restaurants Shanghai has. I live pretty near to Hunter Gather and it’s the first restaurant I tried when I moved to the apartment, and I keep going back since then. The restaurant always use real ingredient and that’s why it tastes amazing! Today I got a Back to Cali bowl (78RMB), as always. I opted for the rice base instead of salad. The salmon is well seasoned, and I love the fresh pineapple with large amount of greens and beans. The only thing is that the avocado sauce today was way too salty for some reason, thus I didn’t touch it. It seems like it’s a bit expensive for bowl like this, but it’s honestly one of my favorite healthy bowls in Shanghai so far. 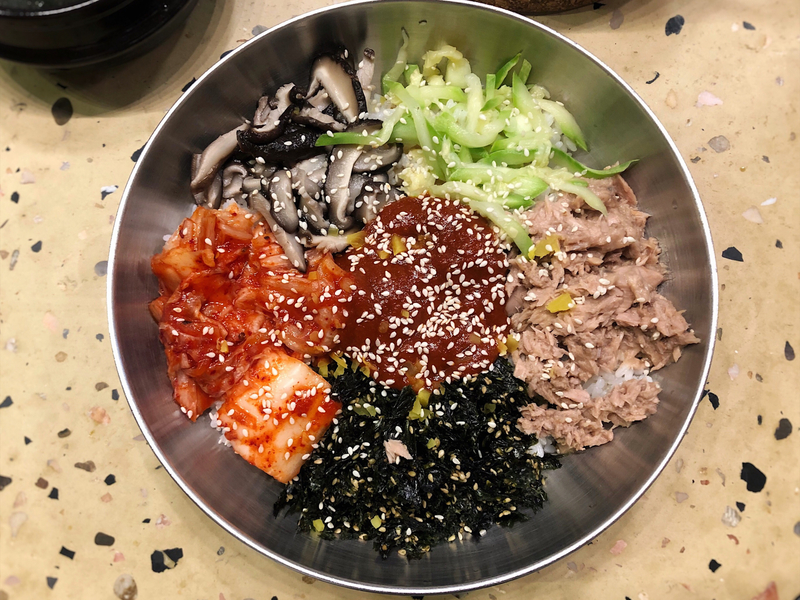 They also have self-made bowl which you can choose your own ingredients. I'm a big fan of Turkish food. 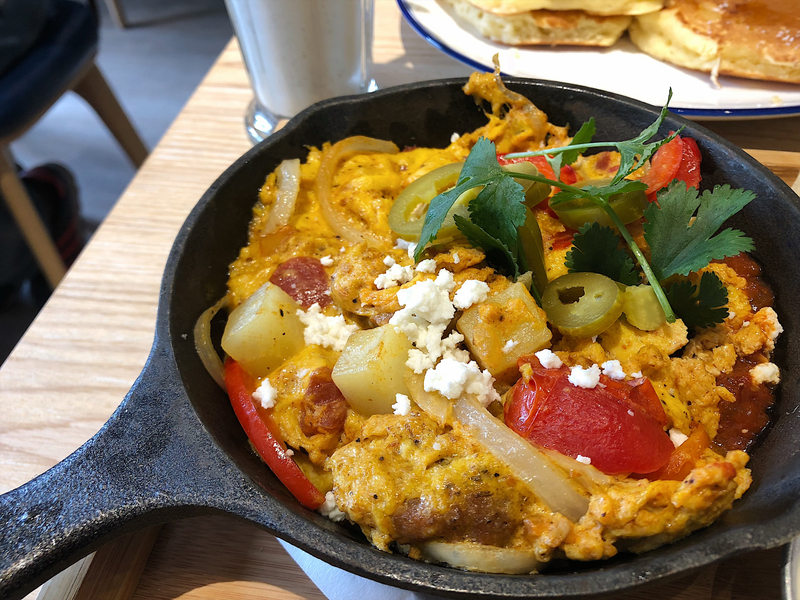 I went to Urban Grill with high expectation and it sure didn’t fail me! First of all, the atmosphere was perfect with yellow lights and open kitchen. (The table next to me proves this since it was a couple, and the lady was holding a rose bouquet.) And the service was definitely on point! We had couple of dishes and they were all excellent! Cheese Carnival Pide (68 RMB) - Look amazing and taste just as good! With great amount of cheese on top of the dough, it’s crispy on the edges and soft in the middle. Definitely a must! Egg And Spinach (RMB) – It was served in the hot pan with enough amount of spices. It’s very simple yet delicious. At the end of the dish the staff found out it herself it wasn’t cook as it should be (Didn’t affect anything to be honest), and offered us a dessert, which is super nice of her. 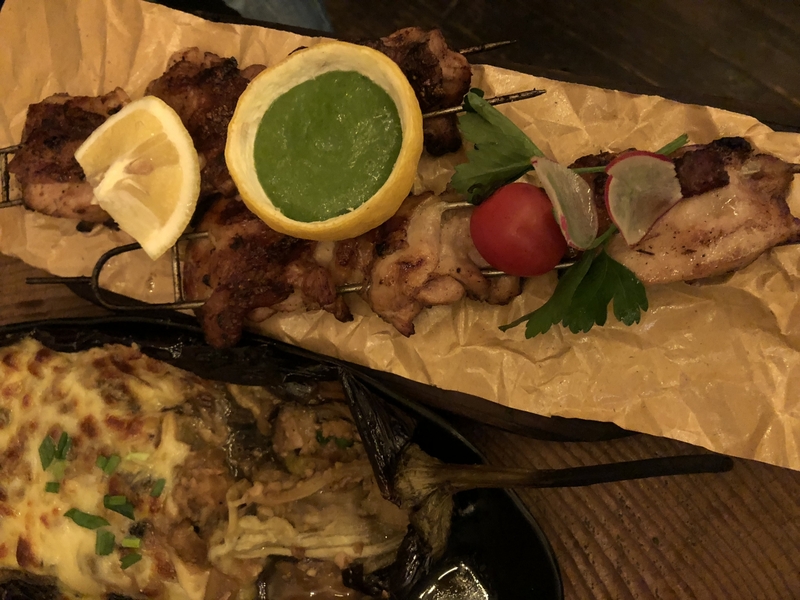 Chicken skewer (98 RMB) – The chicken was tender and juicy, served with grilled vegetables, which were mouth-watering tasty. This is probably my favorite dishes among all. Ice cream – As I mentioned, they are nice enough to offer us an ice cream. It’s stretchy and thick, filling with vanilla smell. Loving the food, the feel, and the service. 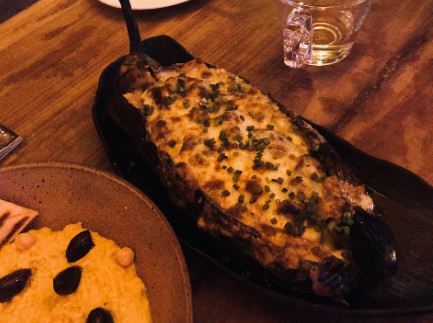 If you are looking for Mediterranean food, Urban Grill will be a great choice to be! It's always good to be reminded of a bit of home! I discovered Tiger Bites with colleagues during lunch time. It was pretty empty in the restaurant during lunch time, but it was a very nice experience! "Gua Bao" is a traditional Taiwanese street food; it's basically cut steamed buns with stewed pork, peanut powder, and parsley. Tiger bites offers a variety of choice on the filling and gives it a nice twist. I went for the classic Tiger Bites Pig (RMB 26) with a side of Sweet Potato Fries (RMB 18), which is also a popular Taiwanese street food. 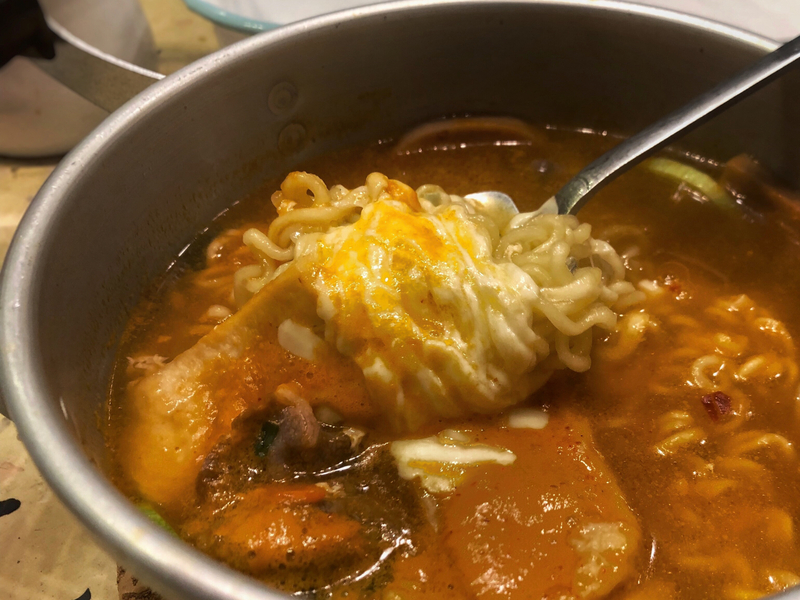 It’s very affordable and I was very pleased by the taste! The bun is a bit sweet, filling with the tender and juicy pork, blending in perfectly with the sour vegetable and a bit of crunch from the peanut. I especially love the sweet potato fries, tasting very Taiwan-like – sweet, salty, and very crispy! 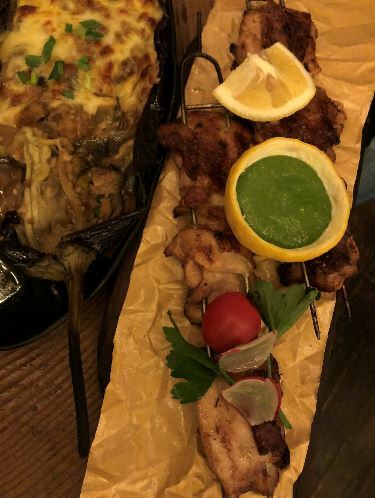 My friend went for the Chicken one and was very satisfied with it as well. The shop itself gives a very modern- feel with the neon logo and metal table. They also have coffee and drinks to offer. At night it becomes a bar with cocktails, how versatile? I’ll definitely revisit and check out the night menu. "So cozy!" This is the first thing I said to my friend when we first stepped in the restaurant. Wood furniture, plaints and white brick wall, it's small but full of personality. Interesting thing is that people there all look like they just finished gym, wearing their gym clothing and carried their own yoga mat, except us. But that didn’t stop us from eating. 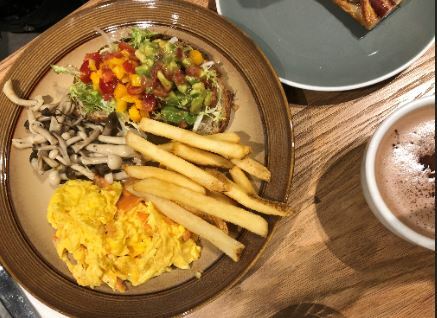 We had an avocado toast, peach pancake, and hot matcha latte. The avocado toast was very delicious with feta cheese on it served on a sturdy piece of grain loaf. While it’s a bit pricy compare to other restaurants and considering the portion. Pancake that day was topped with peach, cream, and nuts. 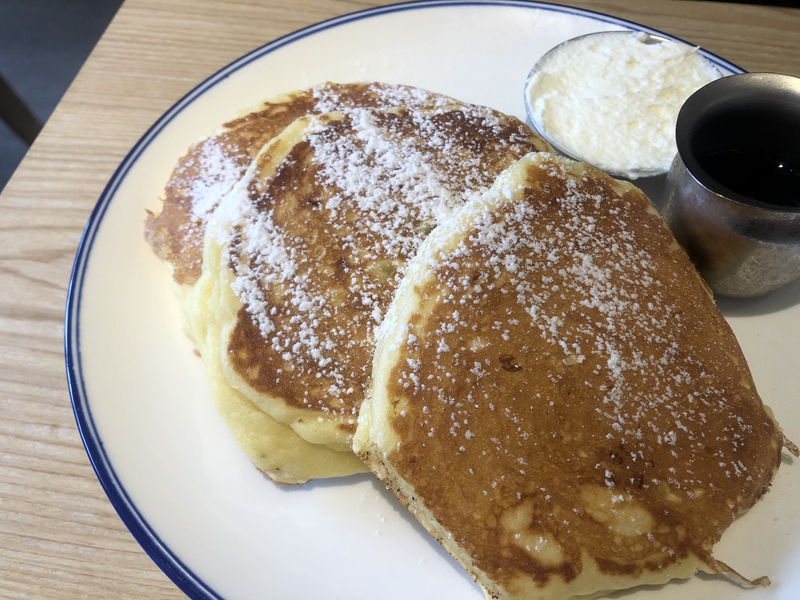 It was surprisingly very fresh and light, which is rare when it comes to pancake. Plus it still tastes very healthy, which is always a plus. And here comes the very disappointing part. The matcha latte was so bitter it taste like Chinese herb to me. I’m a huge fan of matcha so for this reason alone I don’t think I’ll go back to the restaurant. I found out later EGG is actually famous for its healthy meals, grain, vegetable bowls, and more vegetarian options. So maybe that’s a “healthy” version of matcha? I like the place and the staff there are very nice indeed. If you want a healthy brunch place to go I’ll say give it a try, but DON’T EVER order matcha latte. RAC coffee is probably one of the hottest places (for brunch) in Shanghai now, and you can see by the waiting line outside the restaurant. I never really line up for restaurant because when I want food, I want it ASAP. But I waited for 30 minutes this time since I heard so many good things about it. It became pretty obvious why RAC coffee is popular the moment I arrived, beautiful venue, cute table settings, and sophisticated food for your perfect weekend brunching photos to post on Instagram. What about the taste you ask? My friend and I decided to go for crepes all the way. We had a salty one, COMPLETE (70RMB), and two sweet ones, BUTTER/SUGAR (35RMB) and NUTELLA (50RMB). For drink we had a HOT CHOCOLATE (30RMB) and MILK TEA (25RMB), and yes, we were on a complete sugar high later that day. The salty one was on the dry side, very crispy with running egg yolk and cheese, and I found it pretty filling after. I love the Butter and sugar crepe! It’s simple and pretty self-explanatory, but I like the butter balancing out the sweetness, and a bit of crunch from the sugar. I’m a big fan for Nutella while my friend and I weren’t impressed by the crepe. It was okay but just okay, and with the price I suggest you get another dish instead. Overall I did enjoy the restaurant, even after 30 minutes of waiting. The sunshine was warm and you should definitely take the outdoor seats if possible. They also have ice cream and coffee stand outside with less people waiting, looking as delicious!